Imploring the court for leniency, Wertkin said he committed the crimes while on "a terrible path" of substance abuse involving alcohol and marijuana during "a period of heightened anxiety and depression, a sense of impending failure at work and a deteriorating marriage." “I believe I somehow viewed selling the complaints as a way to escape my problems,’’ reads a statement from Wertkin included in a court filing. Wertkin - who specialized in healthcare fraud, planned his brazen scheme as he was leaving his job of nearly six years as a DOJ fraud prosecutor in April 2016 to join the law firm Akin Gump, Strauss, Hauer & Feld as a $450,000 / year partner in Washington. He began copying files for over a month before leaving the agency - including dozens of federal cases that weren't assigned to him, according to court records. From his position at Akin Gump, Wertkin attempted to net potential clients by dangling the stolen information. When that tactic bore no fruit, he stepped up his efforts - reaching out to a targeted Alabama company for $50,000, a New York company for an undetermined price, and an Oregon company to which he mailed a redacted copy of the cover sheet in their federal case as bait. “I thought if I could quickly earn a substantial sum of money, I could provide the material benefits I promised my family upon moving to Akin Gump — a new house in a better neighborhood and private school’’ for his two children, wrote Wertkin, who lived near Dupont Circle. Prosecutors said Wertkin's crime was nothing more than "narcissism and greed," before his 2 1/2 year sentence on two counts of obstructing justice and one count of interstate transport of stolen property was handed down in a Wednesday hearing in San Francisco. Wertkin's counsel had requested a sentence of a year and a day. “Mr. Wertkin’s secret criminal life was not known to anyone at the firm. We were shocked when he was arrested and outraged when his bizarre, treacherous crimes were revealed,” said Akin Gump spokesman Benjamin J. Harris on Thursday. After Wertkin - a graduate of Georgetown Law, lost a $200 million case, he says he was left "devastated" and "a shell of a man," according to his wife Erin Erlenborn. 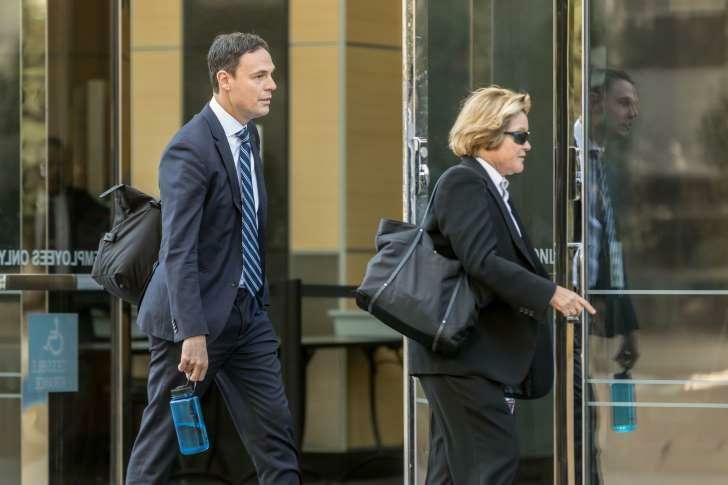 His defense attorney, Cristina C. "Cris" Arguedas said that Wertkin grew "increasingly irrational" and "truly believed he was at the end of his rope," as he called the general counsel of a California firm to try and sell a lawsuit. Wertkin has resigned from the bar.